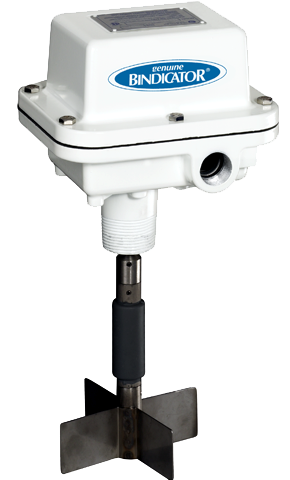 The Roto-Bin-Dicator is the most universal of all level sensing technologies and is the most popular level switch used in dry bulk materials. The Roto-Bin-Dicator is a rotating paddle type, bulk material level sensor offered in a wide variety of paddle options for unequaled application versatility. It is easy to install and requires no special tools or calibration. Bindicator offers the Original Roto-Bin-Dicator models for Low Level Fail Safe protection, Super-Safe-Plus models for High Level Fail Safe requirements, and Mini-Roto for tight spaces.